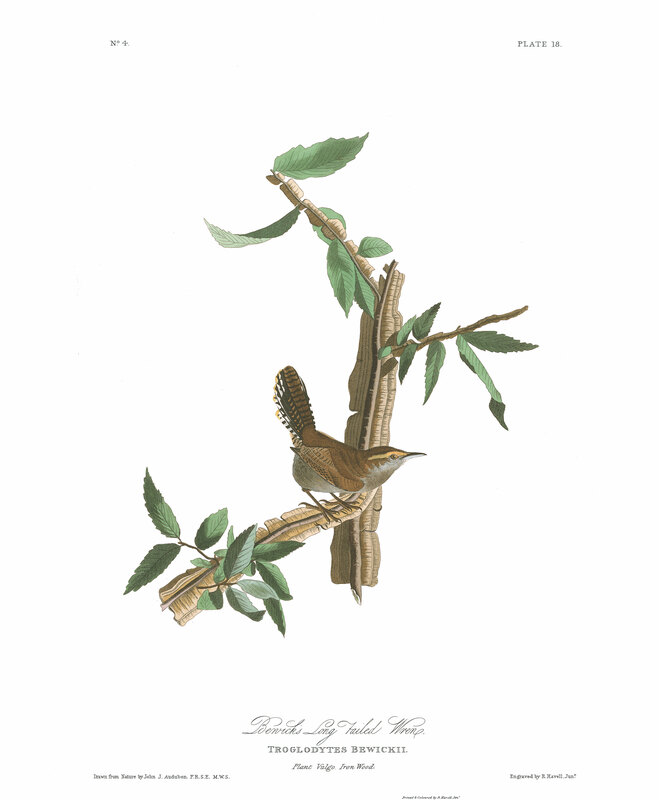 The bird represented under the name of Bewick's Wren I shot on the 19th October, 1821, about five miles from St. Francisville, in the State of Louisiana. It was standing as nearly as can be represented in the position in which you now see it, and upon the prostrate trunk of a tree not far from a fence. My drawing of it was made on the spot. Another individual was shot a few days after, by a young friend, JOSEPH R. MASON, who accompanied me on my rambles. In the month of November 1829, I had the pleasure of meeting with another of the same species, about fifteen miles from the place above mentioned, and as it was near the house at which I was then on a visit, I refrained from killing it, in order to observe its habits. For several days, during which I occasionally saw it, it moved along the bars of the fences, with its tail generally erect, looking from the bar on which it stood towards the one next above, and caught spiders and other insects, as it ran along from one panel of the fence to another in quick succession, now and then uttering a low twitter, the only sound which I heard it emit. It occasionally hopped sidewise, now with its head towards me, and again in the contrary direction, at times descending to the ground, to inspect the lower bar, but only for a few moments. At other times, it would fly to a peach or apple-tree close to the fence, ascend to its top branches, always with hopping movements and, as if about to sing, would for an instant raise its head, and lower its tail, but without giving utterance to any musical notes. It would then return to the fence, and continue its avocations as already described. I shot the bird, and have it preserved in spirits. In shape, colour and movements, it nearly resembles the Great Carolina Wren, and the House Wren. It has not, however, the quickness of motion, nor the liveliness, of either of these birds. For the following observations regarding this species I am indebted to my friend Dr. BACHMAN. "In the month of July 1835, when on a visit to the mountains of Virginia, I heard at the Salt Sulphur Springs the note of a Wren that I did not recognise as that of any of our known species. On procuring the bird I ascertained it to be the Bewick's Wren. There were a pair, accompanied by four or five young, nearly full grown. The notes bore some resemblance to those of the Winter Wren, scarcely louder and more connected. It possessed all the restless habits of the other species, creeping actively between the rails of fences and among logs and stumps. One of them ascended an oak nearly to its top in the manner of a Creeper. I found the young several times during the morning entering a hole in the limb of a fallen tree a few feet from the ground, and conjectured that they had been bred in that situation. I was unable to see the nest. During a residence of a few weeks in the neighbourhood of the Virginia springs I saw several of these birds every day, and ascertained that this was the only species of Wren common in the mountains. The Troglodytes aedon was abundant in all the low country of Virginia, to the foot of the Alleghanies. The T. ludovicianus was sparingly seen in the valleys and along the water-courses, but the present species seemed particularly attached to the highest ridges, preferring grounds that had once been cleared, but now partially overgrown. It did not appear to be a shy bird, but, from its active restless habits, was procured with difficulty. It probably sleeps in hollows during the night, as I saw two or three issuing from the hole of a tree at day-light one morning. The stomachs of those which I examined were principally filled with small spiders, minute caterpillars, and the larvae of insects. A specimen of this bird was sent me from Columbia in South Carolina, procured by Dr. GIBBS, and I have no doubt it will be found on the whole range of our southern mountains." Dr. TRUDEAU has sent the following note:--"The Bewick's Wren must be common in Louisiana. I shot but one there, but I frequently found them in the vicinity of the woods, where it must breed. They are seen in the bushes and dive among them as soon as they perceive the gunner. The nest is different from that of the Carolina Wren." My friends Mr. NUTTALL and Mr. TOWNSEND found this species on the Columbia river, from which country I have specimens perfectly similar to that figured in my plate. No doubt can exist that it has a wide range along the Rocky Mountains, as well as along the elevated portions of our Atlantic States. Mr. TOWNSEND says that it breeds on the ground. I honoured this species with the name of BEWICK, a person too well known for his admirable talents as an engraver on wood, and for his beautiful work on the Birds of Great Britain, to need any eulogy of mine. I enjoyed the pleasure of a personal acquaintance with him, and found him at all times a most agreeable, kind, and benevolent friend. The little twig on which the Wren is perched, is from the tree commonly called the iron-wood tree, a species of elm, the wood of which is very hard and of close texture. The branches, and sometimes the stem, are ornamented with longitudinal expansions, resembling cork in their nature, but much harder. BEWICK'S WREN, Nutt. Man., vol. i. p. 434. BEWICK'S WREN, Troglodytes Bewickii, Aud. Orn. Biog., vol. i. p. 96;vol. v. p.,167. Bill nearly as long as the head, subulato-conical, acute, slightly arched, compressed. Mandibles of equal breadth, with acute margins, the gap line a little arched, and slightly deflected at the base. Nostrils basal, oval, half closed by a membrane. Feet longish, proportionally rather robust; tarsus anteriorly scutellate, compressed, acute behind, longer than the middle toe; toes free, scutellated above, the lateral ones nearly equal, the posterior long; claws slender, compressed, acute, arched, that of the hind toe much larger. Plumage rather compact above, blended beneath. Wings short, very convex, rounded; first quill short, third and fourth longest. Tail erect, long, of ten feathers, much rounded, the outer feather not more than half the length of the middle one, all rounded at the end. Bill brackish-brown above, pale blue beneath. Iris brown. Feet and claws pale brown. The general colour of the upper parts is rusty brown, that of the lower greyish-blue. Quills and wing-coverts barred with rusty brown and black, as are the two middle tail-feathers. Outer web of the lateral tail-feather, and the terminal portion of that of the others, whitish, barred with black, their middle parts black, toward the base barred with rusty brown. A line of pale brownish-yellow extending from the upper mandible, over the eye, to half way down the neck. The rump feathers white towards their base, with central spots. A specimen in my possession measures 5 5/12 inches in length; the bill (7 1/2)/12; tarsus 9/12; hind toe (4 1/2)/12, its claw (3 3/4)/12; middle toe (6 1/2)/12, its claw (2 1/2)/12; wing from flexure 2 2/12; tail 2 2/12. The first quill is 9/12 shorter than the fifth, which is longest, but scarcely exceeds the fourth and sixth. The lateral tail-feathers are 9/12 shorter than the middle.